Strawberry Milk: a blog for fabulously fashioned fetes. 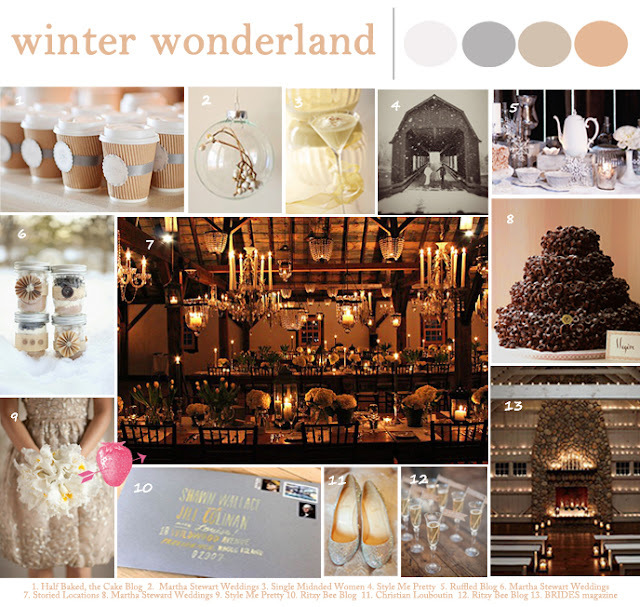 : Wedding Inspiration: Sleigh Bells Ring, Are You Listening? Wedding Inspiration: Sleigh Bells Ring, Are You Listening? It all started with picture No. 7 - that gorgeous Vermont barn wedding with tons of chandeliers and warm candlelight. I love that they used several different chandelier styles for a very vintage/eclectic feel. I have a serious weakness for rustic wood textures coupled with glamorous crystal. Our lovely new intern created the board around this photo. Take it away, Courtney! With the holidays just around the corner and everyone getting in the spirit of the season, it seemed like the perfect time to peek at these cozy winter wedding inspirations. Barns are superb venues to showcase a beautiful winter wonderland. This board sets the tone for a cozy yet sophisticated fête. Hundreds of candles, sparkling champagne and glittering details are bound to create the perfect atmosphere to celebrate with family and friends. Fave details: this decadent chocolate Megeve wedding cake, named for a ski resort in Switzerland. Also, the crafty to-go cups are a warm send off for your guests at the end of the evening. Peppermint mocha, anyone? Thanks Courtney! I'm thinking a getaway sleigh for the bride and groom would just be the cherry on top of this pretty party.